TAG Innovation School is Talent Garden’s school of innovation: the physical platform where digital, technology, and creativity professionals work, learn, and connect. The school develops training courses for students, industry experts, and companies based on the needs of the working and business world. * The data refer to a single product sample, the Master Business Data Analysis. Since its inception in 2015, TAG Innovation School has chosen the email channel to manage its entire communications cycle with its customer base. Talent Garden needed to rely on an integrated email marketing platform in which to gather data and information on all users – potential students – from the various forms on the website, each related to a different training proposal and a different degree of interest expressed by the user. By integrating MailUp, TAG Innovation School was able to use a single tool to accompany the user along the entire acquisition funnel: from a course brochure request, to the submission of an application, up to the activation of the evaluation process, which allows Talent Garden to select the best candidates. Suggests, thanks to a second call-to-action, they apply for the course with an application. Invite, via calls-to-action, users to submit their application to the course. Once the user submits his or her application to the course, a new triggered message is sent: a welcome email containing a link to the online form with which the selection test can be taken. The emails are entirely textual and lack any graphic elements and are sent using the first and last name of one of the Talent Garden Admission Specialists the user interfaces with throughout the selection phase. The emails are sent according to a schedule which includes only working hours on working days, thus excluding weekends and holidays: together, these choices contribute to establishing a direct, authentic, close relationship with the user and, consequently, to increasing email open rates. The flow of triggered emails lets Talent Garden strengthen its one-to-one relationship with users it has already acquired through advertising campaigns. Save on time normally used to manage single leads. Exploit the potential of welcome emails, a type of message that records average opening rates 50-86% higher than those of regular newsletters. Customize the sender of the emails, inserting the full name of the person who will eventually interact with the user: a small trick for creating even closer relationships with interested users. 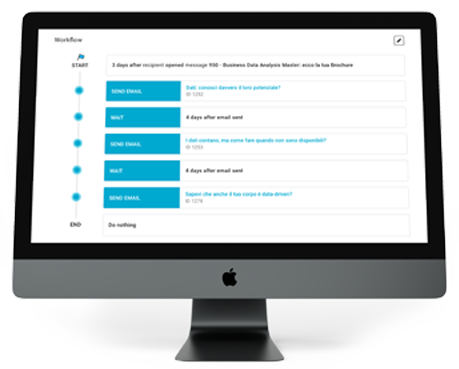 Develop triggered email workflows that touch all phases of the funnel: they allow you to optimize conversions of already-acquired contacts and avoid new investments in lead generation. Create and share original and quality content, to engage and persuade the user to a deeper level than a strictly push sales logic ever could.